Python is a language that allows you to create quick and simple code to do relatively complex tasks. It is very common to use the interactive python interpreter to enter a few commands in order to “figure out” how they work. If you’ve done any kind of basic python tutorial, there will be a step early in the process that asks you to type python in your command line. The functionality provided by IPython is really cool and useful and I encourage you to install it on your system and play with the various features to learn more about it. IPython is very useful and I have used it over the years when working on Django projects. Sometime in 2011, they introduced the concept of the IPython notebook to this powerful tool. For some reason I’m late to the party but now that I’ve had the chance to use them and play with them, I can see their immense power. Imagine you are working with Excel, and have just created a pivot table or done some other analysis. If you would like to explain to someone how to do it, what would you do? Cut and paste screen shots into Word? Record the session via some sort of screen recording tool? Hand them the Excel file and tell them to go figure it out? None of those options are particularly good but are certainly the standard in most places where Excel rules the ad-hoc analysis world. IPython Notebooks in coordination with pandas provide a robust way to analyze large amounts of data and share your process with your teammates. The Python Data Analysis Library aka pandas is a “BSD-licensed library providing high-performance, easy-to-use data structures and data analysis tools for the Python programming language.” Pandas is a very sophisticated program and you can do some wildly complex math with it. In future articles, I’ll go through it in more detail but I wanted to do a quick sample analysis using the same data I used in my sets article. You’ll notice that the input cell looks very much like the IPython command prompt we looked at earlier. For the rest of this article, I will show the various commands I have entered in the cells. I have chosen to download the entire session via reST so it integrates more seamlessly with my blog work flow. If people would like the actual notebook and/or data files, let me know and I’ll post them. 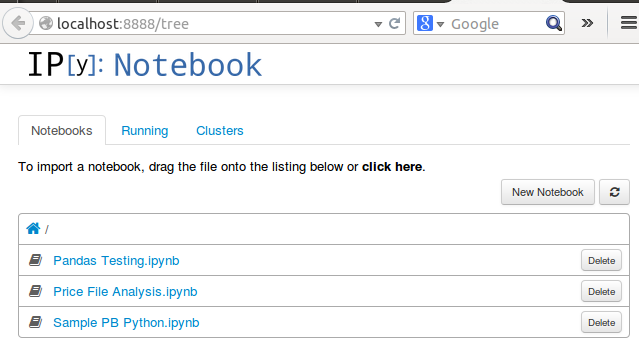 Additionally, the IPython Notebook has a lot of powerful features. If you’d like me to talk through it in more detail - add your input in the comments. I’m open to giving more insight into using this application. Now that I am up and running with my notebook, I can do some pretty powerful analysis. Next, we can read in the sample data and get a summary of how it looks. This command shows us the number of products each customer purchased - all in one command! As impressive as this is, you’ll notice that there are a bunch of NaN’s in the output. This means “Not a Number” and represents places where there is no value. Showing the version of pandas in use since some syntax has changed in the more recent versions. The purpose of this article was to give you a basic understanding of a few interactive python tools and how you can use these to do some complex analysis in a very quick and repeatable way. I plan to spend more time going through examples such as this to show how useful this toolset can be and to continue to let people know that there are alternatives to Excel when it comes to complex data analysis! If you would like to learn more about pivot tables, please look at the Pandas Pivot Table Explained article for much more detail.